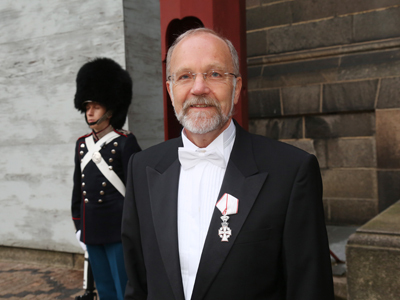 On 14 December 2015, Professor Finn Tarp, Director of the UNU World Institute for Development Economics Research (UNU-WIDER), was honoured with the Order of the Dannebrog by Her Majesty the Queen Margrethe II of Denmark. The Order of the Dannebrog was instituted in 1671 by King Christian V of Denmark and Norway. Today, the Order is a means of honouring and rewarding faithful servants of the modern Danish state for meritorious civil or military service, for a particular contribution to the arts, sciences, or business life, or for those working for Danish interests.